The world was a very different place when Vladimir Putin first came to power in May 2000. Facebook and Twitter did not yet exist, euro banknotes had not entered circulation, and the Nokia 3310 mobile phone was still a few months away from launch. 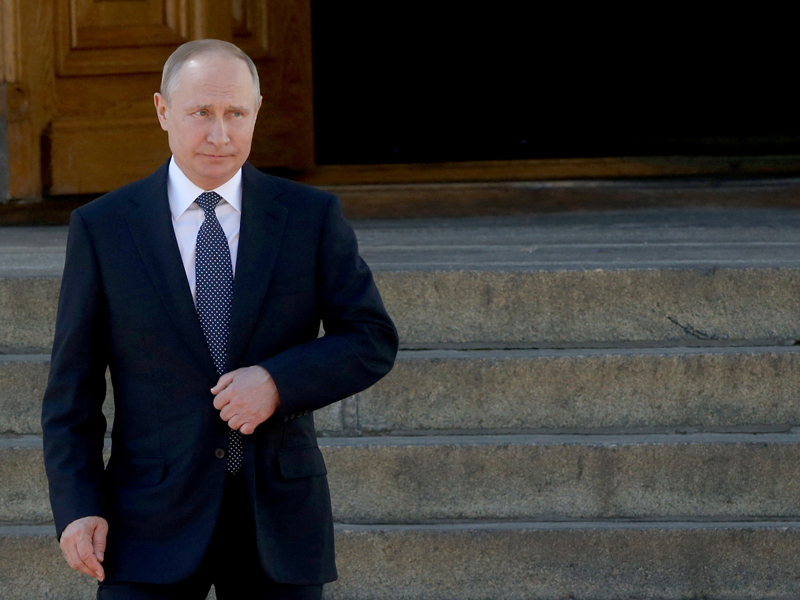 Earlier this year, Putin was re-elected as president for the fourth time, which – when combined with his premiership between 2008 and 2012 – will see him extend his control over Russian politics beyond the two-decade mark. For some of the individuals who voted for the first time in that election, Putin is the only political figurehead they have ever known. Even if some of the ideologies that make up Putinism have remained constant over the years, economically speaking, there have been notable shifts. Putin’s embrace of liberal reforms initially helped pull Russia out of its 1990s slump, but he has displayed a more cautious streak recently when confronted with economic challenges. For a country that must always have one eye on oil prices, economic sanctions imposed by the West have provided a welcome scapegoat for the Russian president, even as they have compounded his domestic problems. While Putin remains in charge, however, the likelihood that the government will initiate the much-needed changes to the country’s economy remain slim. Where his continued presence once provided stability, it is now only delivering stagnation. When Putin first became president, he inherited a country in the midst of a financial crisis. Following the fall of the Soviet Union in 1991, efforts were made to normalise the Russian economy by stimulating the private sector. Unsurprisingly, transitioning to a market-based economy after almost a century of communism proved difficult. While Russia was able to successfully privatise 70 percent of its economy by the middle of the decade, between 1991 and 1998 it saw its GDP decline in real terms by 30 percent. The 1997 Asian financial crisis and the subsequent fall in oil prices delivered another blow. In order to get Russia back on its feet, Vladimir Putin implemented a number of changes shortly after taking office, introducing a flat income tax of 13 percent and simplifying business regulations. On the surface, the reforms appeared to have worked: during Putin’s first two presidential terms, real incomes increased by 250 percent, real wages tripled and poverty was reduced by more than half. Putin’s actions in the early 2000s stand in stark contrast to many present-day depictions of him as an opponent of economic liberalism. Still, not everyone is convinced he should be given credit for Russia’s economic revival. The devaluation of the ruble in 1998 strengthened domestic producers, while rising crude oil prices boosted state coffers – two factors that he had no control over. Alexander Libman, a professor of social sciences and Eastern European studies at the University of Munich, doubts the economic growth of the 2000s was a product of Putin’s economic policy. Perhaps some credit should also be attributed to Alexei Kudrin, Russia’s minister of finance between 2000 and 2011. As a champion of free markets, he played an integral role in liberalising the economy and using oil revenues to set up stabilisation funds in case of future crises. After Kudrin’s resignation in September 2011 and Putin’s return as president in May 2012, the direction of economic policy has been less consistent and, crucially, has failed to address the country’s longest-held problem. With Putin currently in the early months of his fourth presidency, he finds himself faced with some familiar problems. The ruble has depreciated in value by around 25 percent against the US dollar since January 2016, economic expansion is predicted to average just 1.5 percent over the next five years, and the population living below the poverty line stands at 14 percent. Although these figures are healthier than they were in 2000, they are hardly inspiring. Growth rates in particular are far below the global average of three percent, suggesting that the quality of life for many ordinary Russians will not improve significantly for some time. As a developing economy, the country should be performing much better than it is. These problems are proving difficult to shift, partly because Russia has been unable to wean its economy away from its oil dependency. During Putin’s first two terms, when prices per barrel soared above $100, the country could simply spend its way out of trouble, but a rise is always followed by a fall. When prices crashed from $114 in June 2014 to $27 in 2016, Russia’s finances collapsed. Even today, oil prices remain way below their peak at around $80 per barrel. According to Lilit Gevorgyan, Principal Economist for Europe and CIS at IHS Markit, increasing Russia’s economic diversity depends on reducing political risk in the country. As such, it is contingent on building stronger relations with the West – a prospect that looks unlikely for the foreseeable future. The oil and gas industry accounts for over 60 percent of Russia’s exports and contributes to 40 percent of Russia’s federal budget. This is certainly not surprising – it is among the top three oil-producing countries in the world – but by failing to use these funds to boost other sectors and diversify the economy, Russia has been left subject to the whims of the oil market. Putin’s inconsistent economic performance stems from the fact that the Russian Government spends when oil prices are high and tightens the belt when they are low. A longer-term approach could help avoid such volatility. With the Russian Government happy to continue its oil addiction, investment in other parts of the economy has remained anaemic. Low levels of technological innovation, an ageing workforce and widespread corruption make it difficult to attract support from businesses abroad. The problem of attracting foreign direct investment (FDI) has been exacerbated by economic sanctions imposed by the US, the EU and many others following Russia’s military intervention in Ukraine in 2014. 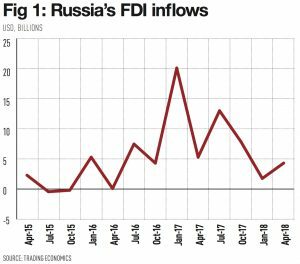 FDI inflows fell by 92 percent year on year in 2015 (see fig 1), although they have since picked up (largely due to the partial privatisation of state-owned oil giant Rosneft), the imposition of new US sanctions in April has caused further anxiety for potential investors. Lower oil prices and economic sanctions have both hit the economy at roughly the same time, making it difficult to quantify the impact of the sanctions alone. However, they have certainly increased risk for potential investors. With Russia losing friends in Europe and the US, Putin has increasingly looked to China for support – a country where his strongman politics are likely to be more warmly received. When compared with the same period 12 months ago, trade between the two countries increased by about 30 percent in the first quarter of 2018 and is predicted to hit $100bn by the year’s end. Still, Russia’s pivot to the east will not be without its difficulties. In May, the purchase of a $9bn stake in Rosneft by CEFC China Energy collapsed amid reports that the government in Beijing was investigating the firm’s rapid expansion. Although the Qatar Investment Authority has stepped in to save the deal, the uncertainties that continue to surround the cancellation add more doubt to an increasingly cloudy investment landscape. What is clear is that China has countries all over the world lining up to be part of its investment proposals, whereas the political risk inherent in the Russian market is unlikely to place it at the front of the queue. Moscow is making efforts to broaden its economy through the launch of a National Wellbeing Fund that diverts oil revenue into long-term reserves when prices rise above $40 a barrel. While this will lessen the state’s oil dependency, it will do little to boost private enterprise, particularly when foreign businesses remain banned from investing in more than 40 industries for national security reasons. Although Putin’s Russia bears little resemblance to the communist society of the Soviet Union, it has retained one of its principal features: the dominance of state-controlled business. An early indication that Putin would reassert the power of the state came in 2003 when the CEO of Yukos, then one of Russia’s largest companies, was arrested on tax evasion charges. The company was subsequently broken up and its assets obtained by government-owned oil firms. Estimates indicate that state-owned enterprises (SOEs) now account for anywhere between 25 and 70 percent of the country’s GDP. Putin’s version of state capitalism, or ‘dirigisme’, has concentrated wealth in the hands of his political friends while destroying commercial competition in the country and stifling innovation. In most parts of the world, new ideas cause some companies to rise and others to fall over time; the three most valuable companies in Russia today have held those positions for more than a decade. Increased state ownership has also rendered attempts at institutional reform largely pointless. If corporate leaders have close ties to the president or his inner circle, there is little reason to do things by the book. In Libman’s view, this has created a hostile environment for private sector operators, making it difficult for the economy to move away from its public sector dependence. Throughout the first half of 2017, the Russian Finance Ministry revealed that 42.5 percent of all procurement contracts awarded by government-owned businesses were allocated without any competitive procedure taking place. Sheltered from market forces, Russia’s SOEs have become breeding grounds for corruption and inefficiency. This discourages entrepreneurs, both Russian and those based elsewhere, from doing business in the country. Gevorgyan believes that while Kudrin remains influential – he has just been given a senior position within the Audit Chamber of Russia – there is hope that state ownership can be stemmed. “However, beyond academic discourse, there are no signs thus far that the private sector will be expanding again,” Gevorgyan noted. For that to occur, Russian citizens may have to wait for a seismic political change, the likes of which have not been seen since the year 2000. If Putin’s domestic economic policies have become steadily more passive, this has certainly not been the case regarding his international actions. Russia’s increasingly antagonistic approach to geopolitics has only been made possible by a bolstering of the country’s armed forces. Between 2003 and 2013, the country’s military expenditure doubled, eventually reaching 4.4 percent of GDP. A 10-year state armament programme, launched in 2011, further reinforced Putin’s commitment to modernising Russia’s military technology. A powerful military adds credence to Putin’s strongman persona and gives weight to his nationalist speeches. During his time in office, he has also demonstrated that he is willing to flex his country’s muscles when he deems it necessary, notably during the 2008 Russo-Georgian War and the 2014 annexation of Crimea. And while Russia’s foreign policy is criticised abroad, it receives significant support at home: in 2014, following Russia’s military intervention in Ukraine, the president’s approval rating increased by almost 10 percent. 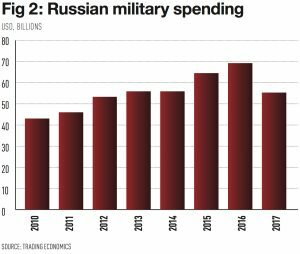 In 2017, however, Russian military spending fell by 20 percent (see Fig 2), the first decline since Putin took power. The Kremlin has committed to lowering its defence budget to just three percent of GDP by 2023, suggesting that internal issues may finally be taking priority. If the strain of Russia’s military expenditure is becoming too much of a burden, then there may be less opportunity for flag-waving and more time for reflection on a deteriorating domestic situation. This will only serve to weaken Putin’s support, regardless of how strong it remains for now. In fact, there are small indications that the tide of public opinion may already be turning: a survey published by the Levada Centre shortly after his election win in March found that 45 percent of respondents hold Putin responsible for a failure to reduce wealth inequality in the country. A shift in focus towards domestic matters is also an indication that things cannot go on as they are. Russia is a country of great potential, with vast natural resources and a population of 144 million, and is already the sixth-largest economy in the world by purchasing power parity. By 2050, it is predicted to move up to fifth place, making it Europe’s largest economy. Instead of depending on rising oil prices for growth, significant reforms are needed. To arrest the decline, Putin could set about overhauling the domestic economy, encouraging diversification and private investment. Equally, his words may turn out to be little more than a smokescreen, and he could return to blaming the bogeyman of ‘the West’ for his country’s problems. After all, Putin is an unpredictable operator – that has been one of the few constants across his long reign.